Many Britons think of themselves as a nation of alcohol-obsessed binge drinkers. It is undeniable that alcoholic beverages have played and play today an important role in British culture and society. Scotch, Irish whiskey, gin, lager and ale are part of the every-day diet for millions of people across the UK, not to mention the growing love for wine. But, is Britain really a nation of drunks? According to the figures, it is not. And if it is, many of its neighbours have an even bigger problem. The World Health Organisation estimated that in 2005, the last year with available data, British adults (those over 15 years of age) consumed an average of 13.37 litres of pure alcohol. Compared to the rest of the EU countries, the UK is the tenth largest alcohol consumer, at the same level than Denmark, and the first being the Czech Republic. However, alcohol consumption in Europe is high by international standards. When compared to countries outside the EU, Britain’s figures seem quite larger, especially in front of developing nations, such as India, China and South Africa. English-speaking countries also have lower levels of alcohol consumption. 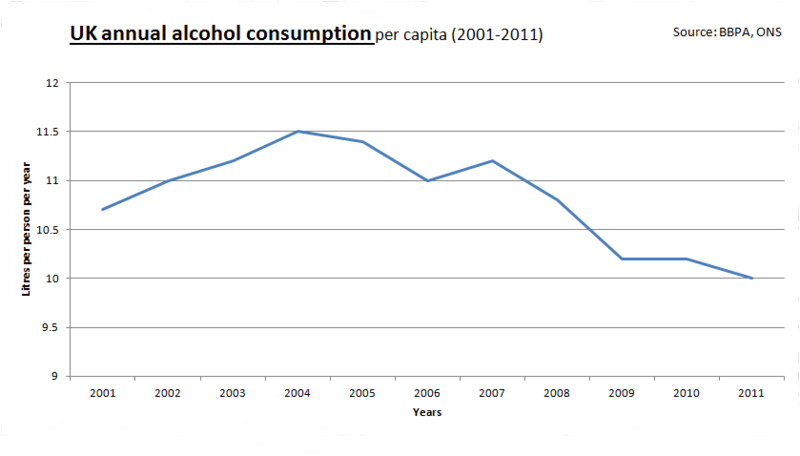 Nonetheless, in the last years the average alcohol consumption in the UK has decreased. But analysing countries is not enough. Drinking can vary a lot depending on the person and their life conditions. Women and men drink differently, as do single and married people. Age is also an important condition to understand drinking habits. For instance, in Great Britain women prefer wine, while men usually drink beer, according to the Office of National Statistics. 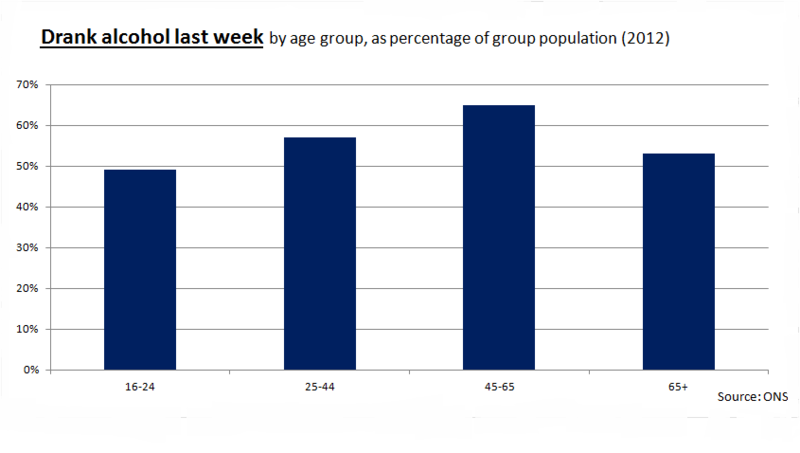 And youngsters and elderly people drink less frequently than middle age people. 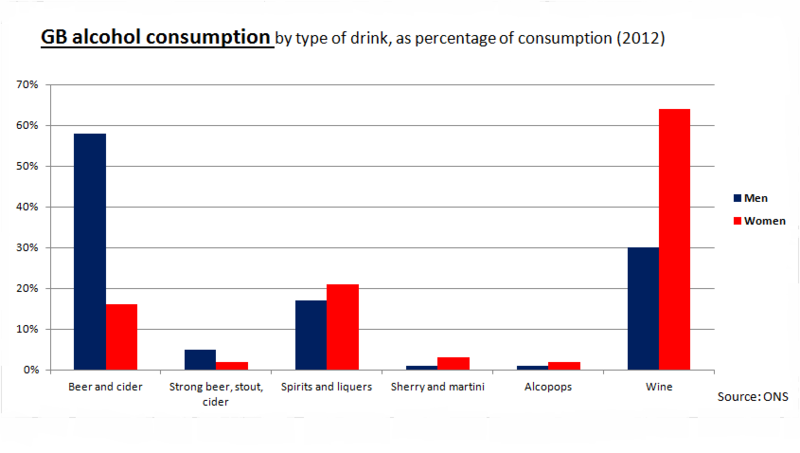 The recommended amount of alcohol by British medical experts is 4 units per day for men and 3 units per day for women. A unit of alcohol in the UK represents about 10ml of pure alcohol. To get an idea, a bottle of wine contains approximately 9 units. Those people who drink under these quantities are considered ordinary drinkers with no health hazards, whereas hazardous drinkers are those who drink more than 4 units in the case of men or 3 units in the case of women. If a person doubles these quantities, it is considered a heavy drinker and if it triples them, it is a very heavy drinker. 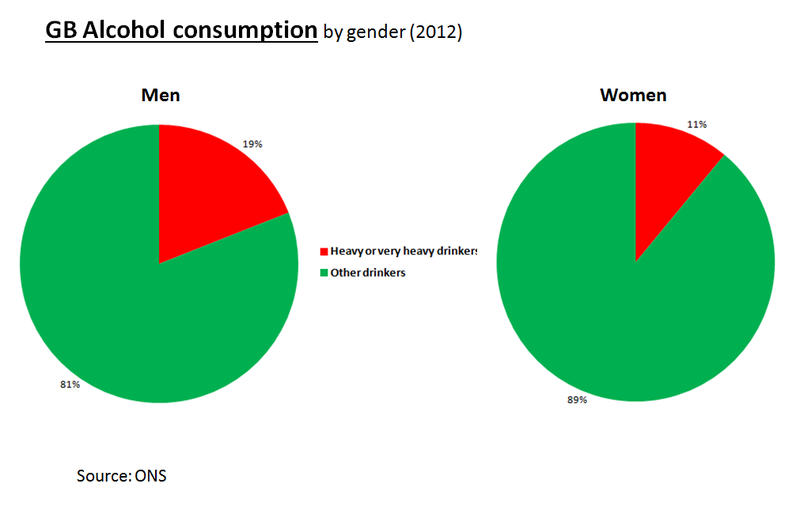 Data show that women drink less than men. However, in both cases the figures are still too high, says Alcohol Concern, an NGO that raises awareness about the risks of alcohol consumption. 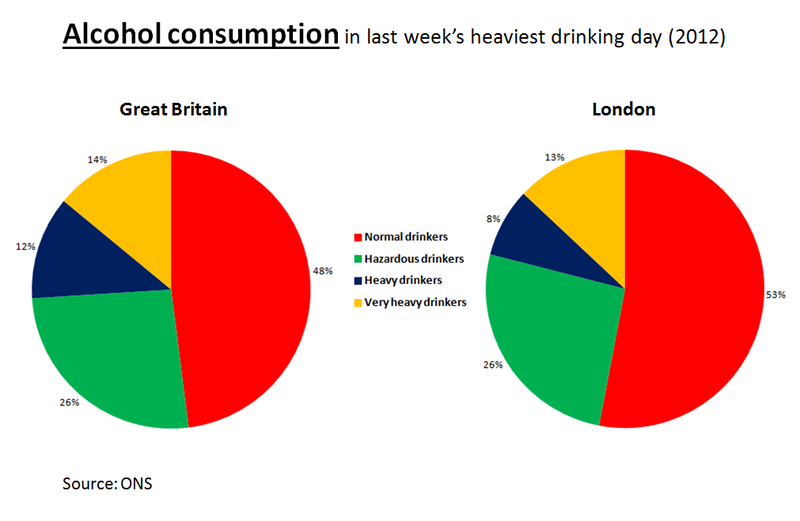 Ironically, despite living in a city with some of the best bars in the world, Londoners drink a bit less than its fellow Britons. Cost of living and urban lifestyle are possible explanations to this phenomenon. A last variable to take into account is smoking habits. 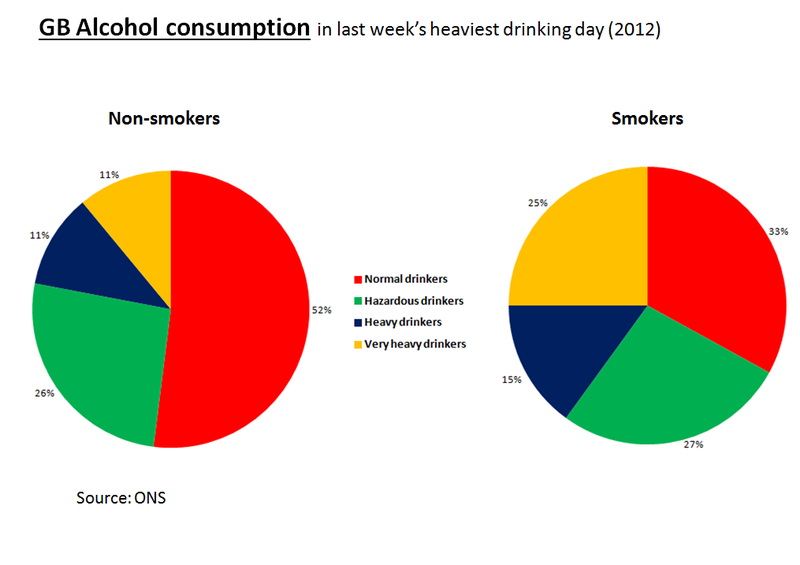 Smokers tend to drink more, and more heavily than non-smokers. It is unclear how drinking and smoking are related. There is a part of social behaviour (people drink and smoke while they socialise, be it in a bar or club, or at home with friends), but medical studies about addiction patterns have not yet reached any conclusion about possible links.